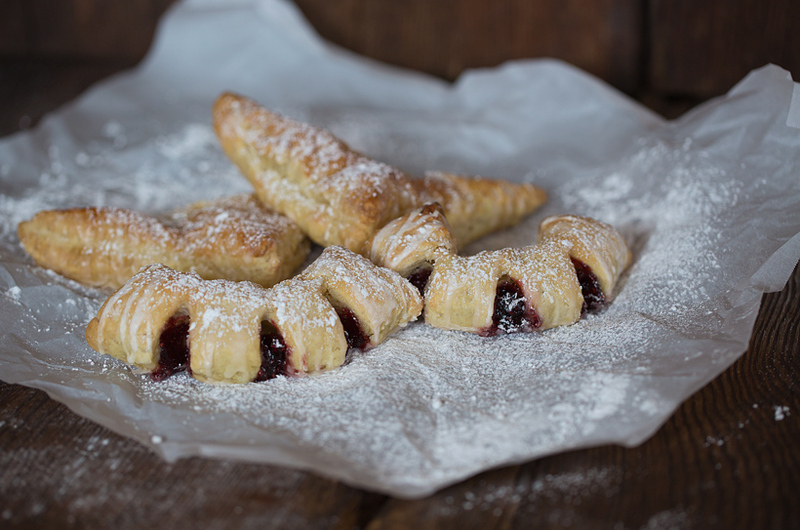 These puff pastry turnovers, are one of those can’t resist desserts you can bake in a hurry. Everyone will want one or two. They tend to look fancy . . . like you spent hours making them. You can just let everyone think that. It’s o.k. They’re so mis-led. All you need is a box of puff-pastry, some filling and your oven. All be honest, this is the first time I’ve ever used the Solo Raspberry Pastry filling. I normally use pie filling for turnovers. I’m really glad I picked up this can though. It’s very nice to work with, because it’s a bit thicker. It doesn’t run all over the place and it tastes really good. You can find it right by the other canned pie fillings. Today I’m making two different shapes of turnovers with one box of puff pastry. Most boxes contain 2 sheets. These are simple, beautiful when baked and delicious when eaten. Simply take your pizza cutter and mark 5″ by 3″ squares. You should have 6 per sheet. Add a tablespoon of the filling down the center or a little off center of each square. Don’t add more than 1 tablespoon, or you’ll have a mess on your hands. I’ve found that you can add a bit more of this Solo filling than the average pie filling however. Fold over, so that you now have a rectangle. You can either take a fork and seal the ends together tightly, or press firmly with your fingers. With a sharp knife or even easier . . . scissors . . . make 3 slits into the dough. Don’t cut through the edge that you’ve just pinched shut!!!!! Stop before you get there. Fan it out slightly and place on a parchment lined baking sheet. You can brush the tops with a little beaten egg wash if you like. It will make the tops nice and golden brown as they bake. Bake at 400 degrees for 15 to 20 minutes or until nicely golden on the tops & the bottoms. Ohhhh . . . look how lovely! 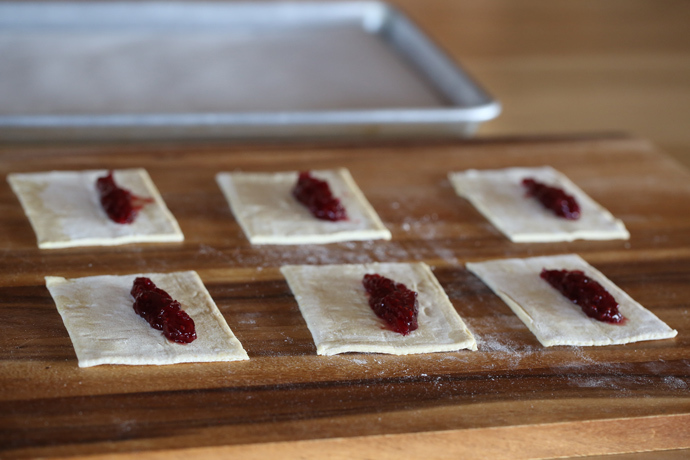 Set these aside while you make six more traditional type turnovers. Cut 6 equal size squares from the 2nd sheet of puff pastry. 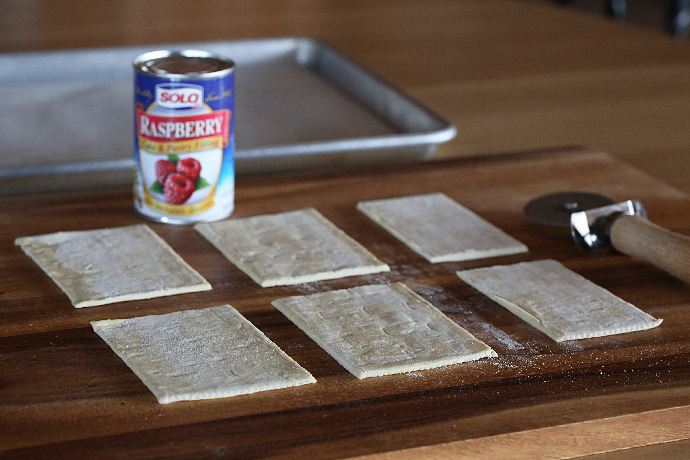 Add 1 tablespoon filling to the center of each square. Snip the center of the turnover with your scissors or use a knife. This will help prevent the filling from bursting from the seams. Bake at 400 degrees for 15 to 20 minutes, or until golden on the tops & the bottoms. Ohhhh look . . . so good and flaky. You can sprinkle the turnovers with powdered sugar or do as I do. Use both! I like to make an easy glaze with powdered sugar, orange juice and vanilla. That’s it. Just put a cup or so of powdered sugar in a bowl . . . Squeeze the juice from an orange into the powdered sugar. Add a teaspoon of vanilla and stir, stir, stir. If it’s too thick, add more o.j. It’s it’s too runny add more powdered sugar. Take a fork or a spoon and drizzle that yummy glaze over the top of the turnovers. Guard them with your life. Don’t turn your head for even one minute, or they’ll be gone! Gone before you intended to serve them. You really want to eat these when they are warm. They are worth every calorie consumed. I promise. They are also good cold. Serve them with a scoop of your favorite ice cream. I love the versatility of puff pastry. 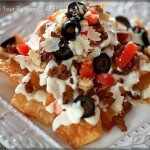 You can add taco meat and cheese and make turnovers for dinner as well. Sausage rolls are also quite delish. Wrap puff pastry around little sausages and make pigs in a blanket. It’s endless. Super Bowl won’t know what hit em!